When Hayden was in 1st ... 2nd ... Some Previous Grade, they did a science unit on oceanography. and for Bonus Points! they could create a 3D version of it. Hayden chose the angler fish because I think he liked the teeth and the lightbulb. of creating a paper mache angler fish. (But in my defense, he is the one that took Art in high school). every picture I have was of Matt and Jeff with messy hands covering this balloon. Kind of like the pottery scene from Ghost, but different. Anyway, I think we can all agree that Matt and Jeff did a fine job and could ACE elementary school! Bonus Points! for anyone who can guess what animal Davis will pick when he studies the ocean unit? I think Davis will pick the Great White Shark, Blake will pick Nemo (clownfish) and Nathan will pick a swordfish. What do I get for my bonus? Wrong, Anonymous! Davis, Blake, and Nathan will all pick an Angler Fish. I love you too, probably. I like the way you think though. The bonus points that keep on giving. 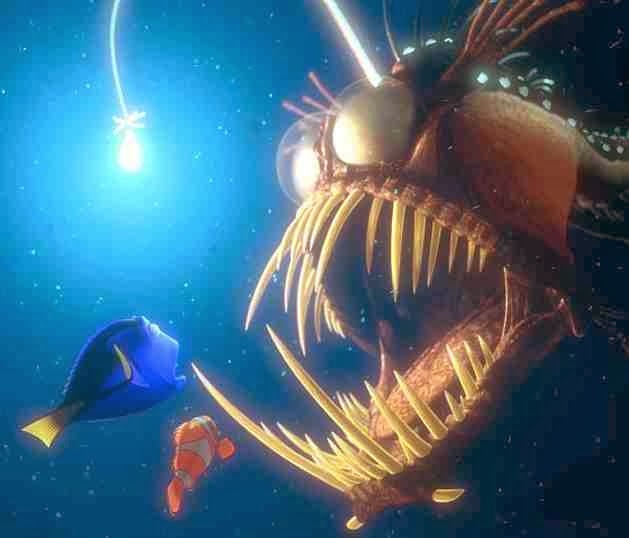 I'm going to start talking up the angler fish to my kids, too. Let's see how many bonus points we can get out of that fish! !